The game will be made up on Aug. 24. The Cleveland Indians and Chicago Cubs didn't force local fans to miss a potential Blackhawks clincher in the Stanley Cup. For that, everybody could thank the weather. 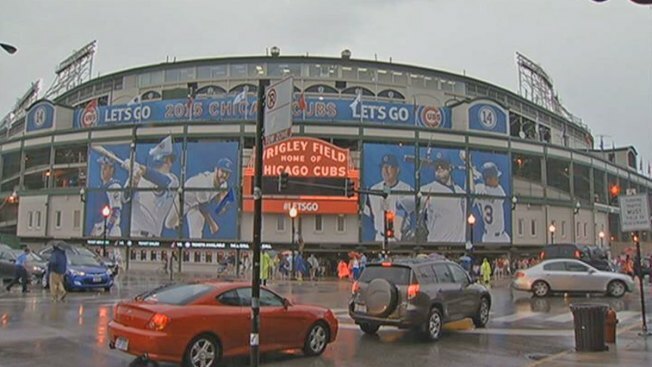 Monday night's interleague game at Wrigley Field was postponed about 90 minutes before the scheduled first pitch because of heavy rain and severe weather. At times, tornado-warning sirens went off around the ballpark. The game will be made up on Aug. 24. And on that date there won't be a conflict with the Chicago Blackhawks, who were facing the Tampa Bay Lightning at the United Center in Game 6 of the Stanley Cup Final with a chance to win their third title in six years. "I would think with (the Blackhawks) playing, they may not want to wait around," Cleveland manager Terry Francona said. "I guess they have a little bit of an issue down here." As Francona alluded to, Wrigley Field is in the middle of a vibrant area that became an unofficial gathering spot for fans after the Blackhawks' previous two Stanley Cup titles. But in both 2010 and 2013, the Cubs weren't in town when the Blackhawks won the NHL championship, avoiding adding a baseball crowd to an already-crowded neighborhood. That wasn't an issue on Monday. And it didn't take long for the Cubs and their players to begin thinking about Chicago's hockey team. First baseman Anthony Rizzo tweeted at 5:48 "Blackhawks! Let's do this" in anticipation of the big game, 11 minutes after the Cubs announced the postponement. The Cubs' Twitter feed was also caught up in Blackhawks fever, tweeting "All eyes on you, @NHLBlackhawks! #GoHawksGo" with an image of the Stanley Cup superimposed over a photo of the Wrigley Field playing surface covered with a tarp. Beyond the Blackhawks, both the Indians and Cubs were coming off eventful weekends. Top Cleveland prospect Francisco Lindor, who debuted off the bench Sunday, was in the original lineup batting second and playing shortstop. Chicago was coming off a series when it beat the Cincinnati Reds in three of four, getting through a two-hour, 48-minute delay Saturday and 11-inning contest Sunday. Starlin Castro, who ended both games with walk-off hits, said the Cubs had plenty of energy entering Monday's game. "We come in here, dress at 5:15," Castro said. "We win, we come in here ready to play."